Welcome to #TwelveLoaves for February 2015! The theme is OLIVES and we’d love for you to join along to bake with us. Use olives of any type or even make olive oil the star ingredient in your bread and share your creation with us. I baked a sun dried tomato and olive bread to share today. I found this recipe in a bread book that caught my eye recently: Bread published by Igloo Books. The book is actually printed in the shape of a loaf of bread! The gimmick drew me in and I wasn’t sure what to expect of the recipes inside but I have been pleasantly surprised– the recipes are no laughing matter and the pages are filled with creative flavor combinations as well as standard bread recipes. Most of the recipes suggest using a bread machine whereas I did not so I’ll include my steps below in the recipe. This particular recipe uses equal amounts (in weight) of sun dried tomatoes and olives and the flavor is boosted by adding in a small bit of olive oil in which the sun dried tomatoes were jarred. I love when jarred ingredients like these add so much interest to a freshly made bread. Your pantry is hiding a lot more flavor than you might give it credit for as this recipe proves. 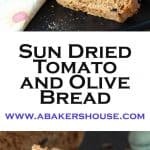 What a beautiful color is created by the sun dried tomatoes in this bread! In a stand mixer place the flour, yeast, sugar, and salt. Add the warm water then use the paddle mixer attachment to mix until well combined and a dough forms. Switch to the dough paddle attachment. Add the olives and sun dried tomatoes as well as the oil. Let the machine knead the dough for 3-5 minutes. If the dough is exceptionally wet, add about 1/4 - 1/2 cup additional flour. Spray a glass bowl as well as a sheet of plastic wrap with baking spray. Form the dough into a ball and rotate it s a times in the greased bowl to cover its surface with oil. Cover the bowl with the greased plastic wrap and let rise in a warm place until dough doubles, approximately 60-90 minutes. Punch down the dough and form into a ball again. Place the dough on a parchment lined baking pan or bread baking stone. Cover with greased plastic wrap again and let rise for an additional hour. Cut a few slashes in the top of the dough with a sharp knife. Place into the oven and bake for 40-45 minutes. #TwelveLoaves is a monthly bread baking party created by Lora from Cake Duchess and run with the help of Heather of girlichef, which runs smoothly with the help of our bakers. 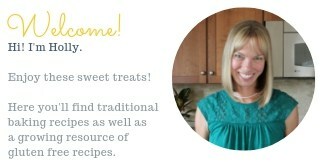 Our host this month is Karen from Karen’s Kitchen Stories, and our theme is Olives. For more bread recipes, visit the #TwelveLoaves Pinterest board, or check out last month’s mouthwatering selection of #TwelveLoaves New Year Challenge Breads! If you’d like to bake along with us this month, share your Olive Bread using hashtag #TwelveLoaves! I really adore sun dried tomatos. They taste so good. I’ve to match them with olives, as you do, in my next bread. Thanks for that idea. Thanks, Rossella, it was such a pleasure to bake with the group again this month. Adding sun dried tomatoes was genius! I love the gorgeous color it gave to your loaf—not to mention the flavor! Thanks, Liz, the sun dried tomatoes did add to the flavor and paired nicely with the olives. What beautiful breads the group baked this month! 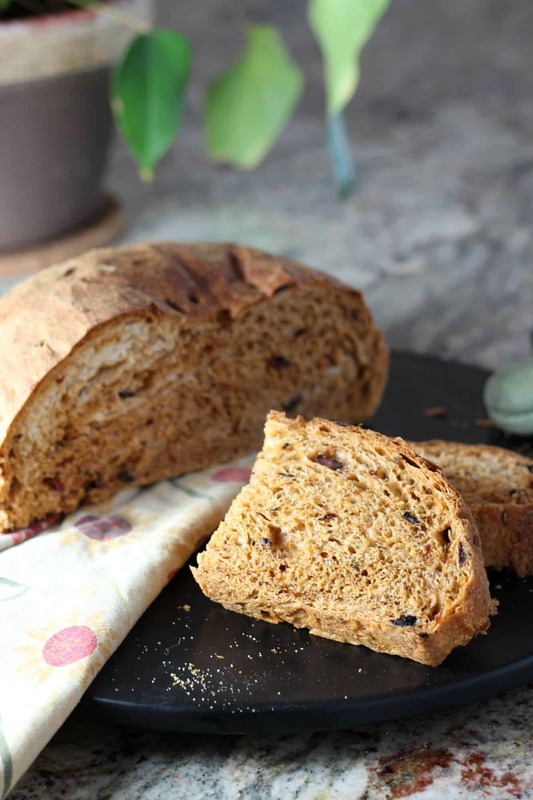 I can imagine the combination of sun dried tomatoes and olives makes this loaf taste amazing, it looks really good. Thanks, Laura, I am going to bake with these ingredients again soon– the house smelled good and the bread tasted great too! Oh, I bet that oil adds an awesome burst of flavor…and it tinted the dough a bit, didn’t it? It’s just beautiful, and what I wouldn’t give for a couple of toasted slices right now! Yes, the color of the dough was really nice and unexpected. Thanks for another great month of baking, Heather! Sun-dried tomatoes and olives are such an awesome combo–my mouth is watering right now. Great looking bread, Holly! Thanks, Robin, definitely an instant flavor combo favorite for me too! I can just taste this. Totally my kind of bread. Thanks, Karen, I need to cook with sun dried tomatoes and olives more often. I think I’ll toss some with feta cheese and pasta. Gorgeous, as always, Holly. Sun dried tomatoes and olives are the ultimate combo for appetizers. And when served in bread – even better! I’ve got a bread machine and appreciate the intro to the fun Bread (shaped) recipe book. Sometimes gimmicks do enough to catch a second look and the shape of this book certainly did so for me. I am lucky that the recipes inside the pages are quite good! I love how the flour has picked up the tomato color! This sounds so good! Beautiful photos! Yes, that color was an added bonus I didn’t expect– so pretty! Sun-dried tomatoes and olives are just a perfect combination, aren’t they? Your loaf came out beautifully. I’ve been all about olives lately. I’ve been indulging in this feta salad that my grocery store sells. It has kalamata and queen olives as well as some spices, big chunks of feta and olive oil. Sun-dried tomatoes are on my list of loves right now, too. 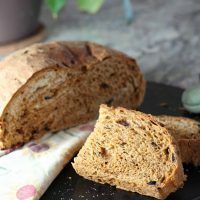 This bread is perfect for an olive lovin’ gal like me! that salad sounds great! I think I’d add some quinoa and make it a meal for lunch. I will have to give it a try this week. Thank, Julie! What a beautiful bread … and it sounds pretty simple to make! Love! couple of questions. I’m in the UK. What is one package of yeast in grams? Thanks for your comment, you bring up good points that I’ll need to add to the post. A packet of yeast in the US is 1/4 ounce which is approximately 2 1/4 teaspoons. Superfine sugar is finely ground sugar. I think in the UK it is called castor or caster sugar. If you only have granulated sugar just whiz it in the food processor or a coffee grinder to transform it into superfine sugar.